If you wish to cancel all or part of your order, please click on the form below to access and complete a Cancellation Form as referred to in clauses 1.2 and 8 of our Terms and Conditions of Sale of Goods. 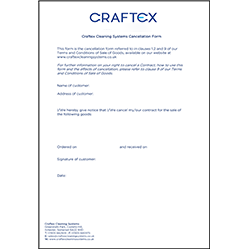 Save a copy of this form, fill in the details, and email it to sales@craftexcleaningsystems.co.uk, or print a copy and enclose this with the goods being returned. For further information on your right to cancel a contract, how to use this form, and the effects of cancellation, please refer to clause 8 of our Terms and Conditions of Sale of Goods. Please note, this form and method of cancellation does not apply to distributors or re-sellers. Contact us for more information if you are a distributor or re-seller wishing to cancel an order.